Interested in the culture and mystique surrounding geishas from Japan? Be amazed by one of the most unique aspects of the Japanese culture known as Japanese geisha art. The word geisha refers to a class of professional hostesses whose job is to entertain their guest by performing a host of different practices. The term Gei means art or performances where as sha stands for people. There is a lot of confusion surrounding geisha art. One thing that people need to understand that geisha hostesses were not your ordinary hostesses and nor were they prostitutes. Rather the geisha class is believed to have descended from the girls who used to dance for the warrior class in the 11th century. Geisha girls are trained in numerous traditional skills ranging from classical Japanese dance, singing, playing of instruments such as the three stringed shamison. Other skills taught to the geisha girls include the art of flower arrangement, wearing and managing a kimono, performing a tea ceremony, Japanese calligraphy and general serving manners. The Japanese Geisha girls had to undergo extensive training that required them to exercise utmost patience. They would continue to polish their skills and learn new ones even after they had earned a place in the geisha team. These days you will be able to find English speaking geisha girls who are even well versed in using the computer. The work of geisha girls has expanded in modern times. These days geisha girls are even used as models on international tours. Geisha girls are used for the purpose of attracting and serving tourists from all over the world. 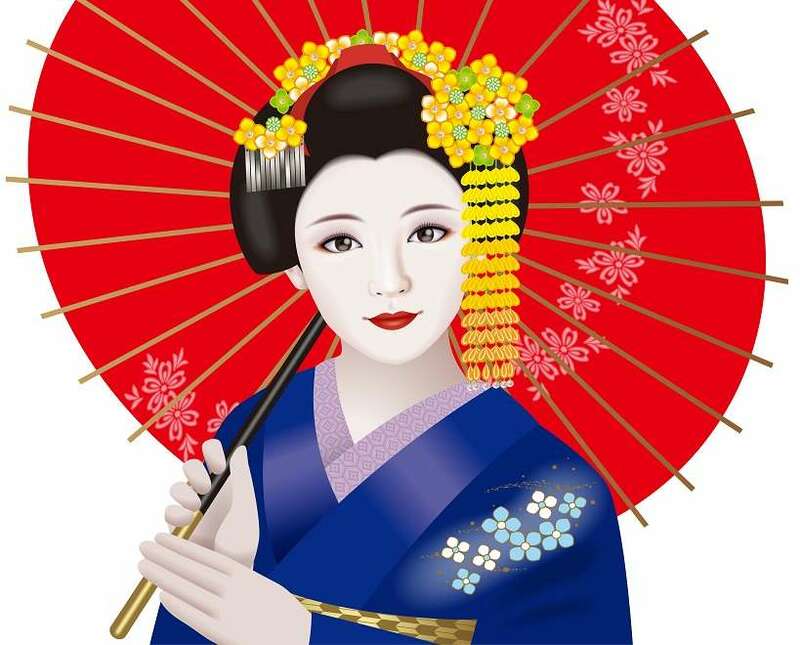 Images of Geisha girls are a common site on Japanese holiday packages. Basically they are instantly recognized as an identity of Japan. This unique and sometimes looked down upon trend has inspired many Japanese artists over time. You will be able to find many Japanese artists making use of this theme in their paintings and other art works. Geisha artwork was commonly found on Japanese fans, sliding doors, curtains and blinds. In fact these items are even sold today. As is the case with most of the themes that the Japanese use for their art work depicting geisha girls was not just about portraying them in an isolated manner. Rather artists sought to use geisha as a concept portraying the inner meanings and symbolism associated with the art. As time moved on the nature of Japanese art experienced some fundamental changes. The post World War One era saw the development of art deco and pop art. This period saw the Japanese artists making use of traditional elements and subject matter and mixing them with the modern trends in art. There is a wide collection of Geisha art belonging to the 1920s and 30s as geisha girls were an integral part of the Japanese culture. Geisha art has now become a means of promoting Japanese culture. The country has managed to retain this form of art as it seems to be quite appealing to the foreigners who visit Japan looking for a taste of its culture.